"The Band's Visit," ''Carousel" and "Angels in America" closely follow with 11 nods each. 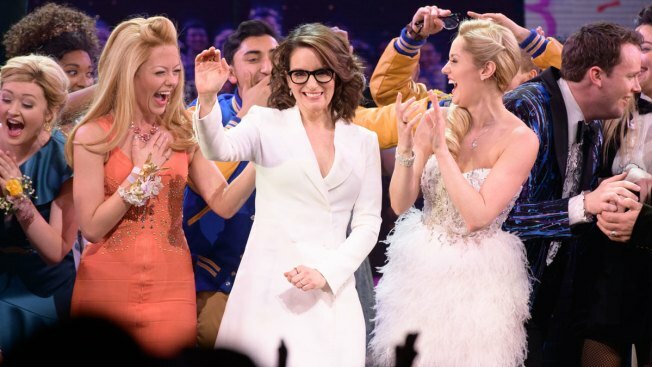 Tina Fey's musical "Mean Girls," which she adapted from her much-beloved and oft-quoted 2004 high school comedy movie, and the goofy undersea adaptation from the cartoon "SpongeBob SquarePants: The Musical" lead the Tony Award nominations with dozen nods each. A British revival of "Angels in America," Tony Kushner's monumental, two-part drama about AIDS, life and love during the 1980s, grabbed 11 nominations — the most for any play — 25 years after it first appeared on Broadway. The shimmering, grown-up musical "The Band's Visit" also earned 11 nods. J.K. Rowling's "Harry Potter" franchise extended its magical touch to Broadway, with a two-part stage play featuring the bespectacled wizard earning 10 nominations, as did a revival of "My Fair Lady." Best new musical category is filled by "The Band's Visit," ''Frozen," ''Mean Girls" and "SpongeBob SquarePants: The Musical." Those musicals that failed to make the cut were the Hal Prince revue "Prince of Broadway," the Jimmy Buffet musical "Escape to Margaritaville" and "Summer," about disco diva Donna Summer. The two-part "Harry Potter and the Cursed Child," which picks up 19 years from where Rowling's last novel left off and portrays Potter and his friends as grown-ups, won nine Olivier Awards in London before coming to America and bewitching critics and audiences alike. It now will face "The Children," ''Farinelli and The King," ''Junk" and "Latin History for Morons" for best new play. Best male acting nominations for a play include Denzel Washington, starring in a revival of Eugene O'Neill's epic "The Iceman Cometh." The 2010 Tony winner for "Fences" will have to face-off against Andrew Garfield in "Angels in America," Tom Hollander of "Travesties," Jamie Parker of "Harry Potter and the Cursed Child" and Mark Rylance in "Farinelli and The King." Amy Schumer, who made her Broadway debut in Steve Martin's comedy "Meteor Shower," won a nomination for best actress in a play. Others in the category include Glenda Jackson from "Edward Albee's Three Tall Women," Condola Rashad in "Saint Joan" and Lauren Ridloff in "Children of a Lesser God." "Carousel," ''My Fair Lady" and "Once on This Island" make up the best musical revival category, mostly because they're only eligible nominees. The best play revival category is filled by "Angels in America," ''Three Tall Women," ''Lobby Hero," ''Travesties" and "The Iceman Cometh." Bruce Springsteen, whose solo show mixes songs and stories from his best-selling memoir "Born to Run" and has been banking over $2 million each week he's onstage, will be granted a special, non-competitive Tony, along with John Leguizamo for "Latin History for Morons." Plenty of nominations don't necessarily lead to actual wins on Tony night. While "Hamilton" was nominated for 16 awards in 2016 and went on to win 11, just last year "Natasha, Pierre & The Great Comet of 1812" earned a leading 12 nominations but got just two technical awards on the big night.